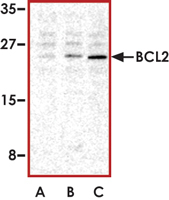 Sample Data :Western blot analysis of BCL2 in A-20 cell lysates with BCL2 antibody at (A) 1, (B) 2, and (C) 4 ug/ml. 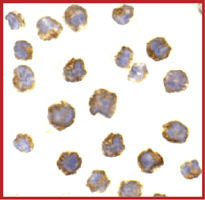 Sample Data :Immunocytochemistry of BCL2 in A20 cells with BCL2 antibody at 2 ug/ml. Scientific Background :BCL2 gene encodes an integral inner mitochondrial membrane protein that acts as an antiapoptotic protein (1). The protein BAD can antagonize both the cell cycle and antiapoptotic functions of BCL2 through binding to the BH3 domain. Constitutive expression of BCL2, such as in the case of translocation of BCL2 to Ig heavy chain locus, is thought to be the cause of follicular lymphoma (2). BCL2 is phosphorylated on specific serine/threonine residues within the unstructured loop in response to diverse stimuli and such phosphorylation has been associated with the loss of the biological function of BCL2. 1. Hockenbery, D. et al: Bcl-2 is an inner mitochondrial membrane protein that blocks programmed cell death. Nature 348: 334-336, 1990. 2. Tsujimoto, Y. et al: Involvement of the bcl-2 gene in human follicular lymphoma. Science 228: 1440-1443, 1985.